The National Health Service (NHS) is the name of the public health services of England, Scotland and Wales, and is commonly used to refer to those of Northern Ireland. They were established together as one of the major social reforms following the Second World War on the founding principles of being comprehensive, universal and free at the point of delivery. Today, each provides a comprehensive range of health services, the vast majority of which are free for people ordinarily resident in the United Kingdom. The NHS began on the 'Appointed Day' of 5 July 1948. This put into practice Westminster legislation for England and Wales from 1946 and Scotland from 1947, and the Northern Ireland Parliament's 1947 Public Health Services Act. Calls for a "unified medical service" can be dated back to the Minority Report of the Royal Commission on the Poor Law in 1909, but it was following the 1942 Beveridge Report's recommendation to create "comprehensive health and rehabilitation services for prevention and cure of disease" that cross-party consensus emerged on introducing a National Health Service of some description. 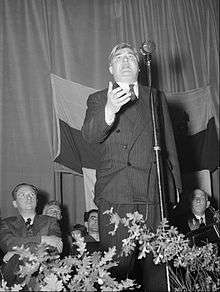 When Clement Attlee's Labour Party won the 1945 election he appointed Aneurin Bevan as Health Minister. Bevan then embarked upon what the official historian of the NHS, Charles Webster, called an "audacious campaign" to take charge of the form the NHS finally took. Three years after the founding of the NHS, Bevan resigned from the Labour government in opposition to the introduction of charges for the provision of dentures and spectacles. The following year, Winston Churchill's Conservative government introduced prescription charges. These charges were the first of many controversies over reforms to the NHS throughout its history. Each of the UK's four nations have their own separate NHS, each with its own history. NHS Scotland and Health and Social Care in Northern Ireland (HSC) were separate from the foundation of the NHS, whereas the NHS in Wales was originally combined with England until devolved to the Secretary of State for Wales in 1969 and then to the Welsh Executive and Assembly under devolution in 1999, the same year as responsibility for the Scottish NHS was transferred from the Secretary of State for Scotland to the new Scottish Government and Parliament. From its earliest days, the cultural history of the NHS has shown its place in British society reflected and debated in film, TV, cartoons and literature. Each of the UK's health service systems operates independently, and is politically accountable to the relevant government: the Scottish Government, Welsh Government, the Northern Ireland Executive, and the UK Government which is responsible for England's NHS. NHS Wales was originally part of the same structure as England until powers over the NHS in Wales were firstly transferred to the Secretary of State for Wales in 1969 and thereafter, in 1999, to the Welsh Assembly (now the Welsh Government) as part of Welsh devolution. However, some functions might be routinely performed by one health service on behalf of another. For example, Northern Ireland has no high-security psychiatric hospitals and thus depends on using hospitals in Great Britain, routinely Carstairs State Mental Hospital in Scotland for male patients and Rampton Secure Hospital in England for female patients. Similarly, patients in North Wales use specialist facilities in Manchester and Liverpool which are much closer than facilities in Cardiff, and more routine services at the Countess of Chester Hospital NHS Foundation Trust. There have been issues about cross-border payments. Taken together, the four National Health Services in 2015-16 employed around 1.6 million people with a combined budget of £136.7 billion. In 2014 the total health sector workforce across the UK was 2,165,043. This broke down into 1,789,586 in England, 198,368 in Scotland, 110,292 in Wales and 66,797 in Northern Ireland. UK residents are not charged for most medical treatment, with exceptions such as a fixed charge for prescriptions; dental treatment is administered differently, with standard charges for most procedures. The NHS is free at the time of use, for general practitioner (GP) and emergency treatment not including admission to hospital, to non-residents. People with the right to medical care in European Economic Area (EEA) nations are also entitled to free treatment by using the European Health Insurance Card. Those from other countries with which the UK has reciprocal arrangements also qualify for free treatment. Since 6 April 2015, non-EEA nationals who are subject to immigration control must have the immigration status of indefinite leave to remain at the time of treatment and be properly settled, to be considered ordinarily resident. People not ordinarily resident in the UK are in general not entitled to free hospital treatment, with some exceptions such as refugees. People not ordinarily resident may be subject to an interview to establish their eligibility, which must be resolved before non-emergency treatment can commence. Patients who do not qualify for free treatment are asked to pay in advance, or to sign a written undertaking to pay, except for emergency treatment. People from outside the EEA coming to the UK for a temporary stay of more than six months may be required to pay an immigration health surcharge at the time of visa application, and will then be entitled to NHS treatment on the same basis as a resident. As of 2016 the surcharge was £200 per year, with exemptions and reductions in some cases. The systems are 98.8% funded from general taxation and National Insurance contributions, plus small amounts from patient charges for some services. About 10% of GDP is spent on health and most is spent in the public sector. The Organisation for Economic Cooperation and Development (OECD) state in a 2015 study that the UK had one of the worst healthcare systems among the nations looked at and that people were dying needlessly through lack of investment in the NHS. By contrast, a 2014 study by an international panel of experts for the US-based Commonwealth Fund declared the NHS as the best healthcare system among those of the eleven countries it looked at. The NHS in England experienced record overspending of £2.45 billion in 2015 and the head of NHS providers, Chris Hopson claimed the NHS is asked to provide too much for too little money. According to Clare Marx, president of the Royal College of Surgeons, balancing the books requires "draconian policies" that frequently go against clinical guidelines including those from the National Institute for Health and Care Excellence (NICE). Pathology laboratories that diagnose cancer are struggling to cope with rising demand. Many of the staff are nearing retiring age and young graduates are not joining the profession to replace them. Cancer Research UK claims similar problems exist with other diagnostic services like scans and endoscopies. Because the UK population is growing and aging more people need cancer diagnosis. Still services are not growing to meet rising demand. The 'Cancer Research UK' report also advises the Royal College of Pathologists to update guidance and study how to attract staff to train for pathology. UK cancer survival rates are below those of other European nations and earlier diagnosis would help deal with this. If nothing is done the problem will worsen. In 2013 over half of the 600 nurses responding to an online poll by the Nursing Times believed their ward or unit is sometimes or always dangerously understaffed. Three-quarters had witnessed poor patient care and thirty percent said poor patient care happened regularly. A spokesperson for the Royal College of Nursing commented that in the worst cases this can cause unnecessary deaths and called for clear national guidelines for safe staffing levels and said one registered nurse to eight patients was considered risky while there should be one nurse to five patients. A spokesperson for Patient Concern, a patient campaigning group, commented that the work expected of nurses was rising continually while staffing levels did not rise. 43% of A&E staff have suffered physical assaults and lack of staff increases the risk that patients will be violent. An editorial in The Independent stated "The National Health Service is in trouble. Statistics on ambulance response times, accident and emergency waiting times and delayed discharges, published [in 2016], are all markedly worse than over the previous year. Ambulances reached critically ill patients within the target of eight minutes less than 70% of the time in the year to June, down from 75% the previous year. The proportion of patients at accident and emergency seen within four hours fell from 92 per cent to 86 per cent. The number of days lost to delayed discharges rose by a quarter from 91,000 to 115,000." The editorial argued further that if the efficiency of the NHS does not improve, this could affect the popularity of the current government. Further almost half of hospital authorities are reducing the number of beds while a third of A&E's are due to close because of increasing hospital deficits. Total NHS deficits reached £2.4bn in 2015, the largest recorded deficit in NHS history. The Public Accounts Committee claims that plans to improve mental health services have a doubtful future due to uncertainties over funding. Only a quarter of patients needing mental health services get them. Mental health services were found hard to navigate and with quality varying. Meg Hillier said, "Many people can make a full recovery from mental health problems if they receive appropriate treatment at an early stage. This is good for them and has wider benefits for the economy and society in general. It is therefore crucial that mental health is given equal priority to physical health and that service provision reflects this. (...) If [the government] is serious about achieving its aims it must also plan to secure skilled staff in sufficient numbers." A Guardian article cited widespread distrust that government promises to increase mental health funding were being met. Mental health services for young people are inadequate according to a poll of nurses working in that area. Shortage of resources and staff are seen as a problem and nurses have insufficient time to talk to young patients or to show patients they matter. Sarah Brennan of YoungMinds said new money promised by the government will only reach a third of those who need it. Nurses fear need to ration care puts young people at risk of self harm or even suicide. The NSPCC claims children needing help following abuse are not getting it and children need to reach rock bottom regularly self harming or feeling suicidal before getting desperately needed help. A leaked government report showed sick children were taken, “almost anywhere in the country” to be treated. Suicide is increasing. Polling suggests the British public overwhelmingly support increased funding for mental health care. According to the General Medical Council, many doctors experience low morale which can put patients at risk. The GMC criticised the amount of funding that the NHS receives, saying that years of constraint coupled with social care pressures were leaving services struggling to cope with rising demand. According to MP Dr Dan Poulter, pressure to deal with patients prevents doctors getting necessary training and there are too few middle grade doctors in paediatrics, obstetrics and gynaecology. According to the Royal College of Physicians (RCP), the Health Service budget has not kept pace with rising demand for services and either funding must increase or care must be cut. There is concern that numbers of medical students fell since 2010 despite patient numbers increasing. The RCP wants NHS efficiency targets overhauled, wants government goals to be realistic and wants investment in 'long-term sustainability' of the NHS. The RCP warns further that government's promise of 5,000 more GP's should not come 'at the expense of other specialities'. Prompt action is needed to counter funding and staff shortages and staff feel like 'collateral damage' when struggling over rising demand and budget shortages. Efficiency improvements can help but it is unclear for how long. Dr Andrew Goddard of the RCP said that providing more expensive treatments for increasing numbers of patients would fail. “As doctors, we see the problems this creates on a daily basis, be it at the front door of the hospital, in A&E or in out-patients. Patients can see it too and realise that the NHS is no longer the envy of the world and isn’t fit for our changing world. There are some big decisions that society has to make and the political parties have to stop blaming each other for where we are and work together to build a health and social care system that is fit for the UK in the 21st century.” The RCP maintains the NHS is living beyond its means which cannot be sustaineed long term. More 'training places' are needed from medical school onwards to counter staff shortages. 2 in 5 NHS doctors are from overseas, the RCP fears uncertainties over Brexit and immigration regulations render their position unpredictable. The RCP reports 70% of doctors in training have a permanent gap in their work rota and 96% reported gaps in nursing rotas. Hospitals record 40% of consultant posts remain vacant. Close to 50% of consultants state they were asked to do more junior work and over 10% of junior doctors said patients were not guaranteed treatment with appropriately experienced doctors. The RCP maintains this makes the government's goal of a 7-day week unachievable. There were complaints that the Chancellor's 2016 Autumn Statement did not include extra funding for the NHS and did not even mention the NHS despite a looming funding crisis. Luciana Berger said in the Commons “There is actually not one single mention in the 72-page Autumn Statement document of the words NHS, social care, mental health, and public health. The Chancellor cannot ignore the fact that our health and social care services are in crisis, facing massive, massive deficits, and surely the many economists in his department will have told him that it’s economically illiterate to ignore the massive decrease in people receiving social care in the community and the cuts to public health and NHS staff training.” There was no boost to funding for social care in England and the number of patients fit to leave hospital who stay because social care cannot be arranged for them rose markedly. Many health think tanks and leaders of the medical profession described the Autumn Statement as a missed opportunity. The Royal College of Emergency Medicine fears government inaction on the NHS could risk lives. A National Audit Office report emphasised financial pressure on the NHS suggesting problems were, "endemic and not sustainable". The NAO confirmed highest level tensions in Whitehall. John McDonnell claimed NHS spending per head is falling for the first time in NHS history. The government claim of adequate funding was contradicted by requests from NHS England and Health Servicer leaders. The NAO concluded, "Confronted as NHS England is by the pressures of rising demand for services, these signs of differences do not help build a confident feel about the future of the NHS." Between 2008 and 2009, owing to a sharp drop in Gross Domestic Product (GDP), health spending rose as a proportion of GDP from 8.5% to 9.1%. Since 2009, GDP has steadily increased again, resulting in health spending falling back as a proportion of GDP to 8.8% by 2013. 'NHS Providers' maintains that the NHS in England needs extra funding to cope with an aging population. Performance has declined over the last few years [before 2016] by most measures and without extra funds, many argue that the service will deteriorate further. Funding increases will fall from 3.8% in 2016 to 1.4% in 2017 and to 0.3% in 2018 while NHS demand and costs rise by at least 4% annually. 80% of hospitals are in financial deficit, as opposed to 5% in 2013. Ambulance response targets were missed 14 months running. A Guardian article suggested there is a strong case for the 7 day service but without extra funding it is unachievable. Without extra funding the NHS in England will according to The Guardian be forced to make unpopular and unpalatable choices. Possibilities include draconian rationing, charging patients, reducing priorities, or limiting the workforce. Chris Ham of the King's Fund think tank said, "It is simply not realistic to expect hard-pressed staff to deliver new commitments like seven-day services while also meeting waiting time targets and reducing financial deficits." John Appleby, chief economist of the King's Fund claims NHS spending could certainly increase. He argues that it needs a political choice to raise taxes, cut spending elsewhere or to reduce the deficit more slowly, and that blaming the NHS in England for choices they have to make through lack of funds is considered unreasonable. Frail patients are staying in hospital longer than would otherwise be necessary because the care they need in the community is not available. This can prevent new patients being admitted and operations have been cancelled due to beds being taken up by patients who could leave hospital with proper care elsewhere. Long hospital stays reduce the chances elderly patients can be rehabilitated. Age UK blamed cuts to social care for creating a situation where elderly patients end up in A & E and also blamed lack of social care for requiring patients to stay unnecessarily long in hospital. The situation has worsened due to cuts in government financial support for local authorities which caused social care for elderly people to fall 17% between 2009/10 and 2013/14. In July 2016 the time patients spent in hospital waiting for care in the community reached 61,000 days which was up from 33,000 days In July 2014. This adds to the costs and pressure on the NHS. In the Vale of York clinical commissioning group in North Yorkshire, obese patients will be barred from most routine operations, notably hip and knee operations for a year (or if they lose 10% of their body weight), while smokers will face a six-month delay unless they quit. The move was described by the head of NHS Providers as an effort by the group "to balance their books". There are fears similar measures will be introduced elsewhere and rationing will become the NHS norm. A critic felt leaving patients waiting in pain longer than clinically necessary should be unacceptable. Denying obese patients life changing surgery without offering help losing weight was compared to racial or religious discrimination by Shaw Somers, a bariatric surgeon from Portsmouth. Limits are being imposed throughout the NHS for cataracts, knee and hip operations, overweight people and smokers are denied some treatments in most NHS authorities. A spokesman for NHS England said: “Major surgery poses much higher risks for severely overweight patients who smoke. So local GP-led clinical commissioning groups are entirely right to ensure these patients first get support to lose weight and try and stop smoking before their hip or knee operation. Reducing obesity and cutting smoking not only benefits patients but saves the NHS and taxpayers millions of pounds. This does not and cannot mean blanket bans on particular patients such as smokers getting operations, which would be inconsistent with the NHS constitution." At a British Medical Association (BMA) conference (the doctors' union), a conference at which some of the contributions may have been politically motived according to the BBC, the NHS in England has been described by some senior medical professionals as overstretched, underfunded and understaffed. Nigel Edwards of Nuffield Trust stated, "the NHS has never experienced this level of austerity for this long a period". Edwards questioned whether planned £22 billion of efficiency savings were fully achievable. UK health spending is a lower proportion of UK economic output than the European average. The BMA argue that overworked and underfunded general practitioners have insufficient time to assess and properly treat patients with complex needs. The Guardian health policy editor suggests that understaffing forces hospitals to rely on agency staff who are much more expensive and this expense is the main reason the NHS overspent. He believes that experts argue the NHS has insufficient funds to care for the ageing population and the increased numbers of patients with chronic health trouble like diabetes, depression, heart and respiratory issues which leads to steady increases in demand for NHS services. In April 2016 he reported that NHS staffing levels had been overestimated and without increases in staff the pressure on the NHS will continue. In response to this report, Labour's shadow health secretary argued that "Hospital wards are already dangerously understaffed and morale in the NHS is at rock bottom. This is impacting on patient care and leaving some staff so overstretched they are unable to complete basic tasks, such as changing dressings or checking patients have finished their meals." Before the 2015 General election, the government promised £8.4 billion extra for the NHS in England by 2020-21. This promise was repeated by David Cameron and George Osborne many times while they were still in office. Despite this, a report by the House of Commons Health Select Committee showed that some of the extra £8.4 billion will be found from taking money from elsewhere in the health budget. For example, money for staff recruitment and training has been moved to a different fund. Staff training has been cut and the money saved will go towards the £8.4 billion. Since staff training is now in a different fund the cut may be overlooked. The report found the transfer of funds that were cut misleading as these other funds finance services that matter for patient care, for preventing sickness and for training the future workforce. According to the report, there will only be a £4.5bn increase in total health spending in England by 2020-21. The committee expressed concern that the transfer of resources from capital budgets, health education, public health and other areas will make ambitions stated in the Forward View, (the NHS blueprint for its modernisation by 2020) much harder to achieve and fails to meet the government's stated commitments. Anita Charlesworth of the Health Foundation agreed with the report and argued that cuts to health education and public health are shortsighted. Consultation will start over cost saving, streamlining and reduction of some services in the National Health Service. The streamlining will lead to ward closures including psychiatric ward closures and reduction in the number of beds in many areas among other changes. There is concern that hospital beds are being closed without increased community provision. Dr Brian Fisher wrote, "STPs are driven by the Treasury. They are focused on reducing NHS spend. (...) Unless STPs meet the funding demands of the Treasury, the plans will not be approved and areas will not receive any transformation money." An article by the King's Fund states, "Allocations from the fund for sustainability and transformation must be agreed in advance with HM Treasury and DH’." The same article states that the spending review, "is both ring-fenced and needs HM Treasury agreement to unlock." The Nuffield Trust think tank claims many suggestions would fail to implement government financial targets and involve a "dauntingly large implementation task". Sally Gainsbury of the Nuffield Trust said many current plans involve shifting or closing services. Gainsbury added, "Our research finds that, in a lot of these kinds of reconfigurations, you don't save very much money - all that happens is the patient has to go to the next hospital down the road. They're more inconvenienced... but it rarely saves the money that's needed." There will be a shift from inpatient to outpatient care but critics fear cuts that could put lives at risk, that the plans dismantle the health service rather than protecting it, further that untested plans put less mobile, vulnerable people at risk. By contrast, NHS England claims that the plans bring joined-up care closer to home. John Lister of Keep Our NHS Public said there are too many assumptions, and managers desperate to cut deficits were resorting to untried plans. The review is about more than reducing costs. An article in The Guardian suggests possible substantial benefits from the review. The system as a whole lacks money and an aging English population has growing complex requirements. Health and social services need to be coordinated, STPs got people working enthusiastically together. The Guardian article suggests NHS England 'made up the policy on the hoof' and managers were under pressure to produce plans fast. NHS England gave fragmented guidance, coming in bursts with frequently insufficient time for responding to requests. There are fears secrecy within the NHS is hindering effective public discussion and without public discussion there is a risk of later delays, protests, judicial reviews. The Guardian article argues that full-time leaders are needed who will not put the interests of their own department before the needs of the whole and will send money where it is needed. Another Guardian article questions whether the plan might be to prepare for greater privatisation after 2020. Transferring services from hospitals to the community will only work if there is spare capacity in the community and GP's are already overstretched. There are too few NHS staff generally to enable the reorganisation. Critics are concerned that the plan will involve cuts but supporters insist some services will be cut while others will be enhanced. Senior Liberal Democrat MP Norman Lamb accepted that the review made sense in principle but stated: "It would be scandalous if the government simply hoped to use these plans as an excuse to cut services and starve the NHS of the funding it desperately needs. While it is important that the NHS becomes more efficient and sustainable for future generations, redesign of care models will only get us so far – and no experts believe the Conservative doctrine that an extra £8bn funding by 2020 will be anywhere near enough." NHS bosses have kept plans for cuts secret, also prevented NHS staff and the public from having an input. Although the NHS routinely outsources the equipment and products that it uses and dentistry, eye care, pharmacy and most GP practices are provided by the private sector, the outsourcing of hospital health care has always been controversial. Outsourcing and privatisation is steadily increasing in NHS England, and NHS England spending going to the private sector rose from £4.1 billion in 2009-10 to £8.7 billion in 2015-16. Private firms provide services in areas such as community service, general practise and mental health care. Denis Campbell, Guardian health policy editor states there is concern the quality of private sector care may be below what the NHS provides. Dr Louise Irvine, of the National Health Action Party, which campaigns against the use of private firms in the NHS, maintains that private firms tend to do the easier work leaving complicated medicine to the NHS. An article in The Independent also suggests the private sector cherry picks the easier cases because those are more profitable, additionally because the private sector does not have intensive care facilities if things go wrong. Professor Allyson Pollock argued privatisation should be monitored to ensure the poor, the old and the sick do not lose out. According to a BMA survey over two thirds of doctors are fairly uncomfortable or very uncomfortable about the independent sector providing NHS services. The BMA believes it is important the independent sector is held to the same standards as the NHS when giving NHS care. The BMA recommends: data collection, thorough impact analysis before independent providers are accepted to ensure existing NHS services are not disrupted, risk assessment to find out likely results if NHS staff are unwilling to transfer to the private sector, transparent reporting by the private sector of patient safety and performance, independent providers should be regulated like NHS providers, patients should be protected if independent providers terminate a contract early, transfers from independent providers to the NHS should be regularly reviewed to establish how much this costs the NHS, private sector contracts should be amended so private sector providers contribute to the cost of staff training financially or by providing training opportunities. Although there have been increasing policy divergence between the four systems there is very little evidence linking these policy differences to a matching divergence of performance. It has been suggested that this is because of the uniform professional culture. There are national terms and conditions of employment across the UK, regulation of clinicians is performed on a UK basis and the health trades unions operate across the UK. However, it does not help that, as Nick Timmins noted "Some of the key data needed to compare performance – including data on waiting times – is defined and collected differently in the four countries." ↑ Choices, NHS. "The principles and values of the NHS in England - NHS Choices". www.nhs.uk. Retrieved 2016-11-23. 1 2 "NHS entitlements: migrant health guide - Detailed guidance". UK Government. Retrieved 6 June 2016. ↑ Beveridge, William (November 1942). "Social Insurance and Allied Services" (PDF). HM Stationery Office. Retrieved 3 March 2013. ↑ Kenneth O. Morgan, 'Aneurin Bevan' in Kevin Jeffreys (ed. ), Labour Forces: From Ernie Bevin to Gordon Brown (I.B. Taurus: London & New York, 2002), pp. 91-92. ↑ Martin Powell and Robin Miller, 'Seventy Years of Privatizing the British National Health Service? ', Social Policy & Administration, vol. 50, no. 1 (January 2016), pp. 99-118. ↑ Wales, NHS. "NHS Wales | 1960's". www.wales.nhs.uk. Retrieved 2016-11-22. ↑ "Breakdown of cross-border agreements is costing English trusts millions". Health Service Journal. 14 February 2008. Retrieved 19 January 2016. ↑ "10 truths about Britain's health service". Guardian. 18 January 2016. Retrieved 19 January 2016. ↑ Cowper, Andy (23 May 2016). "Visible and valued: the way forward for the NHS's hidden army". Health Service Journal. Retrieved 28 July 2016. ↑ "Visiting or moving to England? - How to access NHS services (see "Hospital Services" section)". NHS Choices. 26 June 2015. Retrieved 6 June 2016. ↑ "NHS charges for people from abroad". Citizens Advice. Retrieved 2010-11-16. ↑ "Non-EEA country-by-country guide - Healthcare abroad". NHS Choices. 1 January 2016. Retrieved 6 June 2016. ↑ "Categories of exemption - Healthcare in England for visitors - NHS Choices". NHS England. 18 August 2015. Retrieved 6 June 2016. ↑ "Guidance on overseas visitors hospital charging regulations - Publications - GOV.UK". UK Government. 6 April 2016. Retrieved 6 June 2016. Links to many relevant documents: Guidance on implementing the overseas visitor hospital charging regulations 2015; Ways in which people can be lawfully resident in the UK; Summary of changes made to the way the NHS charges overseas visitors for NHS hospital care; Biometric residence permits: overseas applicant and sponsor information; Information sharing with the Home Office: guidance for overseas patients; Overseas chargeable patients, NHS debt and immigration rules: guidance on administration and data sharing; Ordinary residence tool; and documents on Equality analysis. ↑ "Moving from outside the EEA - Access to healthcare in England - NHS Choices". Nhs.uk. 18 August 2015. Retrieved 6 June 2016. ↑ "How the NHS is funded". TheKing'sFund. 15 January 2016. Retrieved 6 June 2016. ↑ "Health care spending compared to other countries". ↑ Campbell, Denis; Watt, Nicholas (17 June 2014). "NHS comes top in healthcare survey". theguardian. Guardian News and Media. Retrieved 29 August 2016. ↑ "After Brexit, turning around the NHS is Theresa May's most urgent task". The Independent. 11 August 2016. Retrieved 8 October 2016. ↑ Stone, Jon (20 September 2016). "NHS budget pressures will leave mental health services underfunded, spending watchdog warns". The Independent. Retrieved 8 October 2016. ↑ "Underfunded, underdoctored, overstretched: The NHS in 2016". 21 September 2016. ↑ "NHS is underfunded, underdoctored and in crisis, doctors warn - GPonline". ↑ "Starved NHS 'at point of no return' and 'no longer envy of the world'". ↑ "Expenditure on Healthcare in the UK: 2013". UK Office for National Statistics. 26 March 2015. Retrieved 18 September 2016. ↑ "Spending on social care for older people". ↑ Campbell, Denis (3 April 2016). "NHS has 70,000 fewer staff, new figures reveal". theguardian. Guardian News and Media. Retrieved 31 August 2016. ↑ "NHS reform: Why sustainability and transformation plans could be dangerous - GPonline". ↑ "How will services access the new Sustainability and Transformation Fund?". ↑ "Is the NHS being privatised?". The King's Fund. 19 March 2015. Retrieved 11 October 2016. ↑ Bevan, Gwyn; Mays, Nicholas (11 April 2014). "The four health systems of the UK: How do they compare?". Nuffield Trust. Retrieved 2 February 2016. ↑ Timmins, Nick. "The four UK health systems: Learning from each other,". Kings Fund. Retrieved 2 February 2016. Hacker, Jacob S. "The Historical Logic of National Health Insurance: Structure and Sequence in the Development of British, Canadian, and U.S. Medical Policy," Studies in American Political Development, April 1998, Vol. 12 Issue 1, pp 57–130.